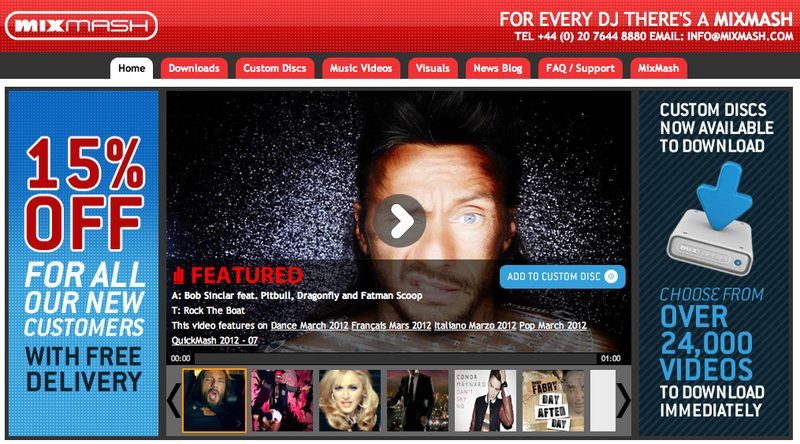 Serato launched Serato Video with Fatboy Slim at the helm this week: Bit by bit, video DJing is hitting the mainstream. This week we’ll turn our attention to hardware. As we’re looking at digital, as always our aim is to keep hardware to a minimum, and also you won’t be surprised to learn that the most important thing – and thus where we’re going to begin – is your laptop. Remember, our focus is on adding video DJing to your DJ sets, as something you do at the same time as DJing – whether that means abstract visuals and loops, your DJ logo dancing across the screen, or simply DJing with music videos rather than audio-only files. So the ideal should be one laptop that does everything for you. While that used to be pretty much impossible (and thus video DJs who were also audio DJs typically carried two laptops with them or even hulked a desktop around to do the video DJ bit), happily now with today’s more powerful laptops you can do both tasks from the one machine. This is just as well if you’ve chosen an integrated DJ/VJ package, but it’s also still possible if you have separate audio and video software (for instance, you want to run Traktor alongside GrandVJ). However, you’re not going to get away with using a MacBook Air, or a netbook, or a $300 basic business machine. You’re looking more at desktop replacement-style laptops or higher-end MacBook Pro, and the important things are the video card and processor speed. As far as the video card – the single most crucial element – goes, Serato Video (for example) recommends Nvidia 8400 or ATI 1650 as minimum for PC, Nvidia GeForce 8600M GT as the minimum for Mac, and GrandVJ specifies minimums of nVidia GeForceFX 5200, Radeon 9200 or Intel GMA 950 (by the way, Serato Video doesn’t work with Intel cards on Windows at all). Note that these are all 3D accelerated graphics card. Bottom line is that if you want cool transitions and effects, the best video card you can afford is crucial – not least because often software tailors what it provides according to the graphics card you have. As always, we recommend you check the spec for the particular software you’re choosing, remembering that manufacturers will state the minimum requirements (they want you to buy their software) – you, on the other hand, should be trying to exceed those requirements for better performance. What kind of graphics output do I need? So your main choice here is between HDMI / digital, and good old VGA (VGA being the signal carried in a typical analogue monitor cable). Before you decide that you want top-of-the-range digital HDMI, consider this: Nearly all video installations are VGA, so check with the venue where you will be performing. If they have VGA projectors or screens, then VGA is going to be fine for you. There’s no real benefit of using digital unless your venue is widescreen 1080p enabled. It’s also worth remembering that when it comes to obtaining material to actually VJ with, it is hard to get hold of HD video material, and when you can it’s expensive. For now, VGA is going to be fine for the vast majority of video DJs, whether you’re playing music videos or VJing with abstract loops and the like. So now let’s move on to the Midi controller side of things. Just like with DJ controllers, the hardware you choose will be based upon your budget, how portable you need it to be, and what you’re trying to do with your VJing. 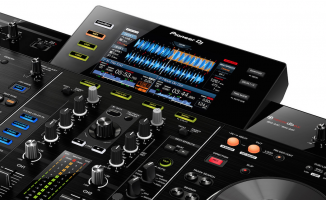 For simpler requirements, many programs are quite happy sharing your DJ controller. 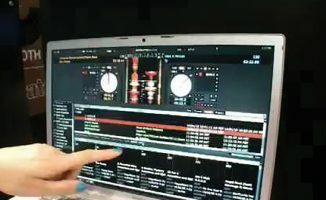 Programs like Virtual DJ which are relatively limited in scope can easily be mapped to spare buttons, and some DJ controllers already have video controls mapped. 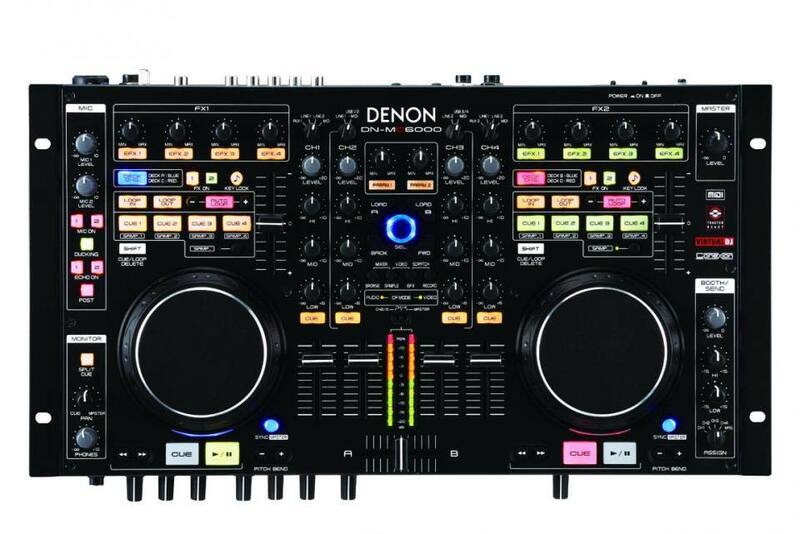 The Denon DN-MC6000 has video/audio crossfader capability for Virtual DJ video built-in. If you’re just playing music videos, the most crucial thing is video/audio crossfaders, and the Denon DN-MC6000, for instance, is adapted to work out-of-the-box with Virtual DJ to give you this, as is the new Stanton DJC.4. But frankly, these are simple mappings to do if you are happy to open the preferences and learn a bit about Midi mapping. Even if you are looking to be a little more ambitious than just playing music videos, as a DJ/VJ it often makes sense to try and keep it all in the one box. A controller like the Vestax VCI-400, for instance, has lots of pads and extra buttons that can easily be attributed to triggering video loops, your logo, transitions and so on. Again, you’ll have to learn about mapping (especially if you want the LEDs within buttons to display the current state, because to do this you need to learn how to get your software to send as well as receive Midi), but it’s not overly difficult to achieve if you’re anyway inclined that way. 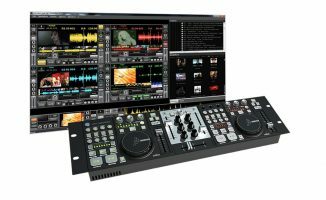 Especially if you have chosen to go down the DJ-software-plus-different-software-for-VJing route, you may decide that a separate controller is best. Technically, there’s no problem setting this up: You use two spare USB sockets on your laptop, one for your DJ controller and one for your VJ controller. You need to ensure they’re not operating on the same Midi channel, but again this is a setting issue that’s simple to check and change if necessary. Then, you effectively have two separate systems running, that just happen to be sharing the same laptop. For sure you’ll get used to the keyboard shortcut for flipping from, say, Traktor to Grand VJ, but that’s about it; this can be a really neat and powerful way to go. Just as we wouldn’t recommend you map a DJ controller from scratch to your DJ software, we also say it’s best for you to look at what the VJ software you’ve chosen recommends you use as a controller. The companies behind the programs, especially the standalone VJ programs, often spend a great deal of time and effort making their software work well with various controllers, and so your starting point should be a controller that they recommend and can give you the mappings for. 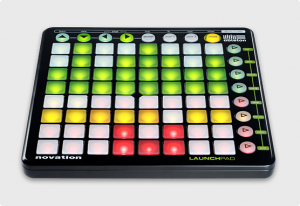 The Novation Launchpad offers a lightweight and flexible control surface for video DJing. While dedicated VJ controllers are few and far between (Numark had one that’s now obsolete, Edirol has a range), many VJs choose to use Akai’s APC20 and APC40 Ableton Live controllers, as they have a good blend of faders and buttons (the latter for launching video clips), and are commonly mapped by software manufacturers. Other VJs have taken to the Novation Launchpad Ableton Live Controller “>Novation Launchpad, because it’s small, light, and also has a large number of backlit buttons to enable clips, transitions and effects to be easily triggered. So how, you may be thinking, is it possible to project different images onto multiple screens, if you have a laptop with a video card that has only one output? Isn’t that why VJs use massive hardware desks, or hulk multi-carded desktop systems around with them? Well, we’re going to finish off our look at hardware by showing you a simpler, cheaper and more elegant way to achieve multiscreen VJing – a way that means you can still throw your gear into a bag and easily take it to and from gigs, leaving your desktop PC safely at home. There’s a piece of hardware called the Matrox TripleHead2Go that ingeniously takes a single signal from a VGA output and splits it into up to three separate signals, to then send to three different projectors. 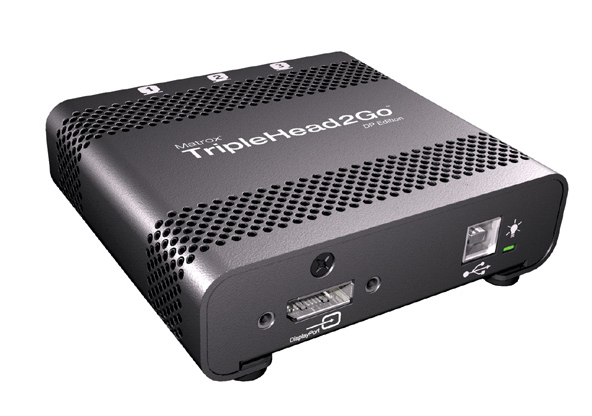 The Matrox TripleHead2Go gives you three independent video outputs from one laptop. In order to use it, you need to set up your video DJing software to output a really wide image – three times wider than normal, in fact. Once done, the box does the rest for you. As you can imagine, this does take some setting up, but the power it gives you if you’re prepared to jump through the hoops necessary in order to get it all working smoothly is incredible. Just think: You could turn up at an arena gig with just a single laptop, one or two lightweight Midi controllers and your Matrox box, and provide both sound and video, across multiple screens. Try doing that without the digital revolution! 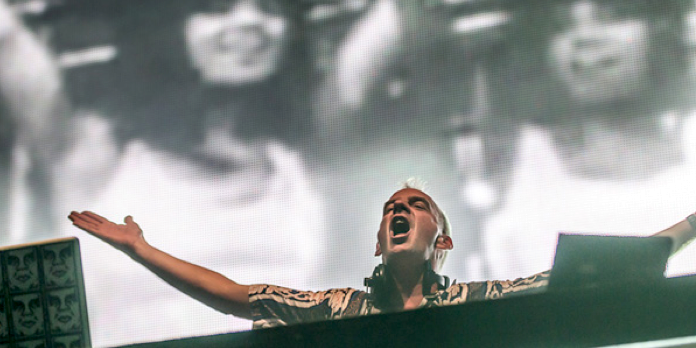 We always say you should be trying to do stuff that makes you stand out as a DJ. Do you know any other DJ in your area who can offer all of this? A final word on making sure everything runs smoothly. With video DJing (more so than audio DJing) it’s absolutely vital that you have what’s called a “technical rider”. This is a document that tells the venue or venues where you’ll be performing exactly what you need, so there are no surprises when you turn up, and it’s simply a case of plugging in. 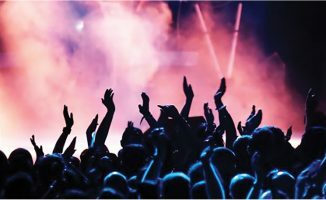 As you’ve done all the preparatory work before the gig, and you’ve set up your system so you know everything works as it should, this final piece of the puzzle is what ensures everything goes according to plan. So your technical rider, even for the most complex system as described above, really need say no more than: “I need a surface three feet by two feet for my gear, three VGA leads for your three projectors, and a line input to your mixer for audio.” What you don’t want to happen is you turn up and find you can’t plug your video in to their screens because you didn’t check compatibility or confirm they’ve got the right leads beforehand. In a way, so far has been the easy part. Just as with DJing, the gear is ultimately just a means to an end – the material is where you really make your mark. And just as with DJing, the video material you choose to play is a completely personal thing, and we’re not going to tell you what source material you should or shouldn’t be VJing with. Where to find videos and video loops online is the subject of next wee’s article. However, we will show you the kind of material people typically use in VJing, and where to get it from – whether that’s music videos or dedicated VJ loops. • Thanks to Dan Booth for his valuable input in this article. 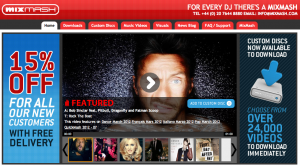 A DJ for 15 years, Dan began adding visual content to his act in 2005. As well as developing his own AV act to incorporate four virtual music decks and up to three separate video outputs (all running from one laptop! 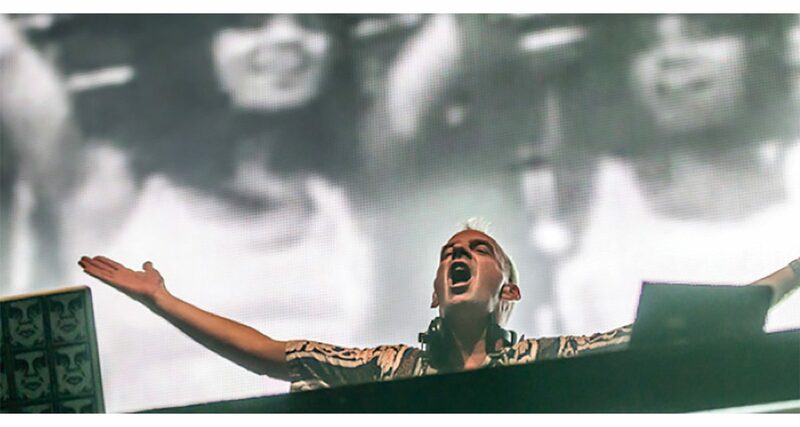 ), he has performed visuals for Carl Cox, The Shapeshifters, Armin Van Buuren, Paul Van Dyk and Defected Records to name but a few, to crowds in excess of 30,000 people. He’s based in Goa, India. Are you a VJ? What’s your set-up? What hoops have you had to jump through to get everything working well? Have any venues given you particular challenges to overcome? We’d love to hear your thoughts in the comments. I use a powered HDMI splitter – this way I can plug into the TV’s anywhere – just bring the cables! Good guerrilla thinking, but can you imagine that in a bigger venue? It would be like having to take cables for the PA system with you! what kind of powered splitter? and signal loss? Oops, meant to say TouchResolume on TouchOsc instead of livecontrol. Also using numark mixtrack and mpd32 to control traktor. Eventually it would be nice to set up the mpd to control both resolume and traktor, maybe on different channels or with a shift button or something. Purchase a VGA converter box.. I have several of them. Takes a VGA signal and converts to s-video or RCA. No matter what venue you walk into you should have converters/adapters in your bag to connect to whatever leads they have available. Would a Mac Mini work with regards to GrandVJ? I guess i’m talking about Video Card and making sure there is no lag. I understand it doesnt have a true video card (INTEL 4000), but is there any way to get creative.